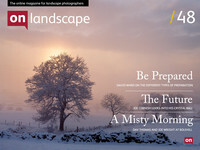 "How about a piece on the future of Landscape Photography?" Tim suggested brightly. "Hmmm, great idea, I'd love to read something on that. Obviously a job for the Professor (David Ward)." "He's off to Tasmania so you'll have to do it. Oh yes, and I am going online with the redesign of the magazine monday so it needs to be in before then. It's a big issue for us so the content needs to be really good. Got that? Excellent, catch you later." Click, the phone hangs up. I'm not sure about every detail of the conversation, but in a nutshell, that's what led me to this moment. So today, in between editing, formatting cards from the last shoot, backing up, more editing, answering emails, meeting a client, and wrapping up prints, I have been thinking about the future of landscape photography.